Photos of the student's and their artworks are at the bottom of this page. I am fascinated by the likes of Derren Brown and The Mentalist. I love looking at human behaviour – why do we act in certain ways, how do we react to stimulus and why are some people better at some things than others. I would like to be better at drawing. So when professional artist, Jeanni Grant-Nelson, said that she could have me filling a pad with images that I would be proud of within three hours I was intrigued. During our session I discovered that Jeanni is an art whisperer. She takes you on a journey using some fascinating exercises - some without pencil even touching paper, pointing out your patterns of behaviour as it unfolds. It is an eye-opening experience, whether or not you want to develop your artistic talents. We started by drawing a chair, a building and a woman. Out came my stick chair, woman complete with triangle dress and a tin mine. Jeanni’s first point was quickly made – I was not drawing what I saw. Jeanni explained how we fall back on patterns of learnt behaviour – especially under stress. Using some very clever exercises (which I will not give away here!) Jeanni highlighted I was making assumptions rather than really looking. These exercises helped me to focus on looking at the subject and less time looking at my page. Now breathing properly, feeling far more relaxed, my drawing became looser and I found myself really enjoying myself, whilst Jeanni drew attention to things that I was doing and drawing my potential out. Could I actually be one of the many success stories that Jeanni rightfully talks proudly about? You will have to judge my results for yourself, but I’m still astounded by what I created in a three hour session, where we spent most of the time talking and understanding conditioned behaviour. Not just an art lesson, Jeanni uses her sessions to open minds. Perhaps her teachings should be called ‘the art of well-being’ as you are totally focused and external realities slip away. However, using skills from the old masters, Jeanni taught me more about the fundamentals of art in few hours than during years of GCSE Art and A Level Ceramics. Jeanni has enabled me to draw. Which sums up what she does – enables you, skills you, gives you an understanding of how you have been programmed to approach things and what you can achieve if you take a different approach. Lessons that I will apply to other areas of life, not just art. I will also use what I have learnt as an escape and form of relaxation, breathing deeply and calmly, losing myself in what I am creating, no longer fearing failure. Jeanni also helped a gentleman who had broken his back. He was sought out by a very worried wife after a couple of hours, as he had missed his pain medication – he hadn’t even noticed. He was fully engrossed, engaged in creativity and having fun. What Jeanni offers is for anyone, at any age, at any ability, or with any medical condition. It opens doors, minds and eyes, making you look and think again about many aspects of life, helping you to find your true ability and potential. Jeanni is a professional artist and a graduate teacher. Her seascapes, landscapes, portraits and animal commissions can be found in private collections across the world including Holland, Germany, France, USA, Australia and in UK galleries. 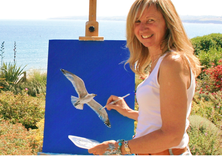 Her images are on sale at Truro Cathedral and the National Trust and she is also the artist in residence at The Nare. She teaches art in a range of ways and places (including on line), to diverse audiences, for different reasons – from straight art lessons to team building and therapy. She has worked in locations which include the Emirates Stadium with professionals such as UK Sport, British Basketball, Olympic coaches and returning ex-servicemen, through to leading business people; from London’s homeless, to Neuroscientists at Oxford University. She brings out artistic talents in people that firmly believed that they did not have any - who are then amazed, myself included. She has a unique way of teaching which activates different parts of your brain so that you observe differently and create differently – both in art and life. Jeanni unravels what is holding you back and then gives you the knowledge to free yourself from your habits and fears. Jeanni teaches the true fundamentals of sketch, paint and perspective but so much more. Her classes are structured as a set of three 3-hour sessions: lesson one - sketching and the structure of picture making; lesson two - perspective, vanishing and focal points, shadows and reflections; lesson three - paint and colour for any medium and a consolidation of information. Jeanni offers residential or non-residential courses, lessons at a location of your choice, or on line, and she brings all of the equipment that you need. but those who are interested in human behaviour or want to experience a sense of well-being. You can do just one lesson, or do all three.